I know tons of people who outright hate horror movies and tons of those who dismiss them or never bother watching them. 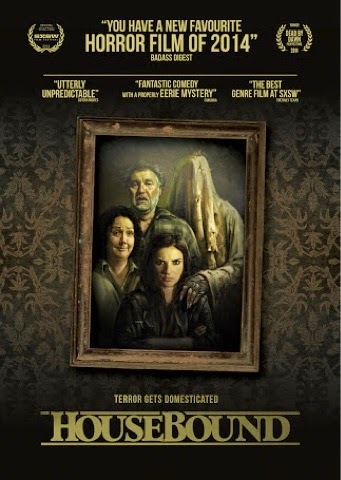 Well "Housebound" (2014) now on Netflix is one of those movies that shouldn't be dismissed. My advice is to stop reading this now - especially if you're the kind of person that easily discovers spoilers in non-spoiler reviews - and just go watch this work of art. But if you still need convincing, read on. Besides having some real creepy scares and a bit of "in your face" blood & gore (just a bit) this flick has a great story, a perfect plot, wonderful characters - including the main character - a hard case juvie that's given up on the world, a security guy who's a part-time paranormal investigator, and especially - well, I don't want to give away anything. Let's just say that every character has some great moments that make you smile, laugh out loud, or even cry - yes, cry! Okay. Now quickly go rent or buy your copy of this flick and watch it! Still not convinced? Without letting the cat out of the bag, this movie has such a great twist (a few actually) which really work naturally and comment on the the two worlds normally at odds in a horror movie - the straight Normal vs. the odd Other. As an Other myself, watching this forced me to admit that I can be as myopic as any Normal and I think that Normals will, after watching, find themselves sympathizing with Otherness and perhaps even get a glimpse on how both worlds simultaneously feed off and force each other into existence. Too deep? You don't have to look very deep in order to enjoy this flick - you can enjoy it as a fun and scary run through a carnival house of horrors (c'mon, I double dog dare ya) - but I love that you can look deeper and find solid motivation for every character. My highest recommendation. Three thumbs up.